Derrick Henry had a huge game earlier this season against Wisconsin. Can he have similar success against Michigan State? The Big Ten and the SEC are about as close to rivals as two leagues can be. The bowl season always offers several high-profile matchups, mostly on New Year’s Day, where the conferences match up. They’re easily the leagues with the most television exposure, with the Big Ten Network being owned by Fox and the SEC Network owned by ESPN. But until last season, their rivalry was about as hard-fought as the battle between a hammer and the nail. Over a four-year period, the SEC’s bowl record validated its reputation as the best conference in the country. The SEC has a 26-14 record while the Big Ten is at 14-21 in that same timeframe, due in large part to the consistent New Year’s Day beatdowns the SEC delivered. But last season marked a change. The overall performances were close to even, with the SEC going 7-5 and the Big Ten clocking in at 6-5. In the head-to-head matchups, Wisconsin beat Auburn and most important was the high-profile victory of Ohio State over Alabama in the Sugar Bowl/College Football Playoff semi-final. It wasn’t the whole story—Missouri also beat Minnesota and Tennessee coasted past Iowa. But the two biggest stories of last year’s college football postseason were Ohio State’s national title and the collapse of the SEC West. In addition to Alabama, LSU, Ole Miss and Mississippi State all laid an egg in their bowl matchups. The defeats were a big blow to SEC prestige and an offseason where Michigan’s hire of Jim Harbaugh was the most significant development added to the positive buzz moving around the Big Ten. The SEC reclaimed some mojo in non-conference play this season when Alabama handled Wisconsin, but the real test begins now. Each conference has put ten teams in bowl games and they’ll play head-to-head in five of those, including another Playoff matchup when Alabama meets Michigan State in the Cotton Bowl. I want to walk through some of the factors my staff and I at WinningEdge.com are looking at with each game, both the head-to-head conference matchups as well as ones they’ll play against other leagues. But before beginning, I want to remind everyone of an adage that many in football handicapping subscribe by—it’s that the pointspread matters less in the bowl season than any other time of year. The reason is that underdogs often end up winning outright—disinterested favorites are common and Las Vegas can misfire in pricing teams from disparate parts of the country with few common opponents. I mostly agree with this line of thinking and believe the focus of football betting should be picking the outright winner. For those of you who are in bowl pools where you’re required to pick every game against the number, that’s a good thing to keep in mind. Zach Mettenberger is off to a hot start in 2013. The first weeks of the college football season have seen Alabama, Georgia, Texas A&M and South Carolina garner the spotlight in the highly competitive SEC. Now, after three straight non-conference games, the LSU Tigers are ready to jump into conference play and regain some of the limelight. After opening the conference schedule at home on September 21st against the Auburn Tigers, they will have to break out the LSU luggage for back-to-back road games at Georgia and Mississippi State. By the time LSU returns home to face Florida on October 12th it will be very clear whether Les Miles’ squad is a contender for the conference and national title. If LSU is able to withstand their SEC challenges, a big reason is likely to be the play of senior quarterback Zach Mettenberger. 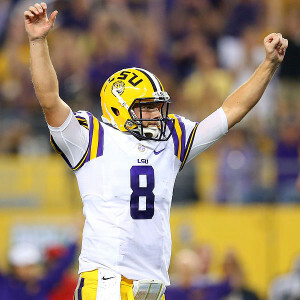 After struggling at times a year ago, Mettenberger has been outstanding so far in 2013 in his first season playing under offensive coordinator Cam Cameron. 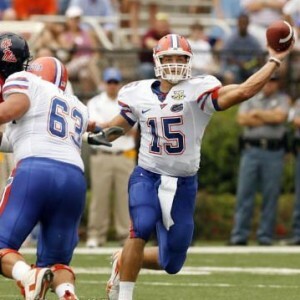 All conversations about the SEC have to start with the Florida Gators and senior quarterback Tim Tebow. Overview: The SEC has claimed the last three BCS Championships and there is a good chance the Florida Gators could make it four in a row. As usual, the SEC is loaded with talent, which makes going through the entire season undefeated a tough task (and something none of those three champions has been able to accomplish). In addition to top ranked Florida, Alabama (#5) and Mississippi (#8) are ranked in the AP Top 10. With LSU (#11) and Georgia (#13) also ranked high, the SEC has more teams in the top 15 than any other conference.